Do you want the instrument to test the unknown pressure of a pipeline? The Deadweight Gauge is the most accurate instrument available for the pressure measurement. Repeatable readings with accuracies of 0.1% and 0.05% of measured pressure are obtainable. The device does not require recalibration unless the components have excessive wear of weights.It can be easily transported and set up in the field, requires minimum maintenance and is simple to operate. Do you want the instrument to calibrate gauges and transducers? With the addition of a pressure pump, valves and pressure connections, the hydraulic Deadweight Gauge becomes a Deadweight Tester and can be used to calibrate pressure transducers and other, less accurate dial faced types of pressure gauges. The pneumatic deadweight instruments are considered testers since they deliver air and accurate pressure using an unregulated supply. The most accurate instrument available for the measurement of pressure above a few psig is the Hydraulic Deadweight Gauge. This type of gauge operates on the principle of balancing a known mass against the force exerted by an unknown pressure on a piston of known area. When an exact balance is achieved, the unknown pressure "P" is equal to the mass "M" of the weights divided by the area "A" of the piston, according to the formula "P" = "M" / "A". In us, weights are removed or added from the piston's table, as with a double-pan balance until the piston "floats" without net vertical movement. Primary pressure standards are generally more accurate than secondary pressure standards. A primary pressure standard must revert to fundamental units of mass and length. These fundamental units can be determined with a high degree of precision. The two primary pressure standards are the Deadweight Tester and Gauge and the "U" tube manometer. Accuracy on primary standards is stated as a percent of reading. Other precision pressure instruments, i.e. electronic manometers, quartz tube pressure transducers, bourdon tube dial gages, etc are classified by the National Institute of Standards and Technology (NSIT) as secondary comparison standards. Secondary standards' accuracy is usually stated as percent of full scale. Electronic testers are used for instrument calibration in pace of deadweight testers because they can be less expensive and more convenient to use. However, the money lost due to calibration error can be in the hundreds of thousands of dollars per year for a typical pipeline. By definition, in order to b considered a primary standard, all measurements must be traceable to physical standards of mass and length and all errors inherent within the instruments must either be eliminated or evaluated. The physical standards for a deadweight tester and gauge are traceable to NIST. In practice, measurement accuracies of 1/10th of 1 percent (1 psig in 1000 psig) or better are obtainable and instruments accurate to 0.02% of reading are commonly available commercially. The accuracy of most dial faced gauges and pressure transducers are specified as a percent of full scale which means that a 1000 psig instrument with an accuracy of 0.5% is accurate to 5 psig at any pressure reading. If you are reading 100 psig, the same error could be 5 psig or 5%. The deadweight on the other hand, retains the same percent of accuracy at any pressure within its specified range. A 1000 psig deadweight is accurate to 0.1% at 10 psig or 1000 psig. Deadweight Testers and Gauges also have excellent sensitivity. Low pressure models with large diameter pistons have higher sensitivity at the lower end of their range and are recommended for checking orifice meter static pressure in gas distribution systems. Sensitivity of 1.0 psig is typical. 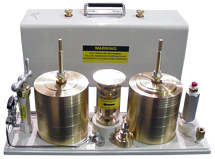 The Deadweight Tester and Deadweight Gauge are the most accurate and cost effective instruments to use to calibrate secondary pressure devices or to measure unknown pressure where a high degree of precision is required. Accurate: 0.05% of indicated pressure, traceable to the National Institute of Standards and Technology (NIST). Reliable: Hardened stainless steel pistons and corrosion resisant materials.